The problem of data-aided synchronization for orthogonal frequency division multiplexing (OFDM) systems based on offset quadrature amplitude modulation (OQAM) in multipath channels is considered. In particular, the joint maximum-likelihood (ML) estimator for carrier-frequency offset (CFO), amplitudes, phases, and delays, exploiting a short known preamble, is derived. The ML estimators for phases and amplitudes are in closed form. Moreover, under the assumption that the CFO is sufficiently small, a closed form approximate ML (AML) CFO estimator is obtained. By exploiting the obtained closed form solutions a cost function whose peaks provide an estimate of the delays is derived. In particular, the symbol timing (i.e., the delay of the first multipath component) is obtained by considering the smallest estimated delay. The performance of the proposed joint AML estimator is assessed via computer simulations and compared with that achieved by the joint AML estimator designed for AWGN channel and that achieved by a previously derived joint estimator for OFDM systems. In the last years, the interest for filter-bank multicarrier (FBMC) systems is increased, since they provide high spectral containment. Therefore, they have been taken into account for high-data-rate transmissions over both wired and wireless frequency-selective channels. Moreover, they have been considered for the physical layer of cognitive radio systems . One of the most famous multicarrier modulation techniques is orthogonal frequency division multiplexing (OFDM), embedded in several standards such as digital audio and video broadcasting or Wi-Fi wireless LANs IEEE 802.11a/g. Other known types of FBMC systems are Filtered Multitone (FMT) systems, that have been proposed for very high-speed digital subscriber line standards  and are under investigation also for broadband wireless applications  and, moreover, OFDM based on offset QAM modulation (OQAM), considered by the 3GPP standardization forum for improved down-link UTRAN interfaces . Unlike OFDM, OFDM/OQAM systems do not require the presence of a cyclic prefix (CP) in order to combat the effects of frequency selective channels. The absence of the CP implies on one hand the maximum spectral efficiency and, on the other hand, an increased computational complexity. However, since the subchannel filters are obtained by complex modulation of a single filter, efficient polyphase implementations are possible. Another fundamental difference between OFDM and OFDM/OQAM systems is the adoption in the latter case of pulse shaping filters very well localized in time and frequency [5, 6]. 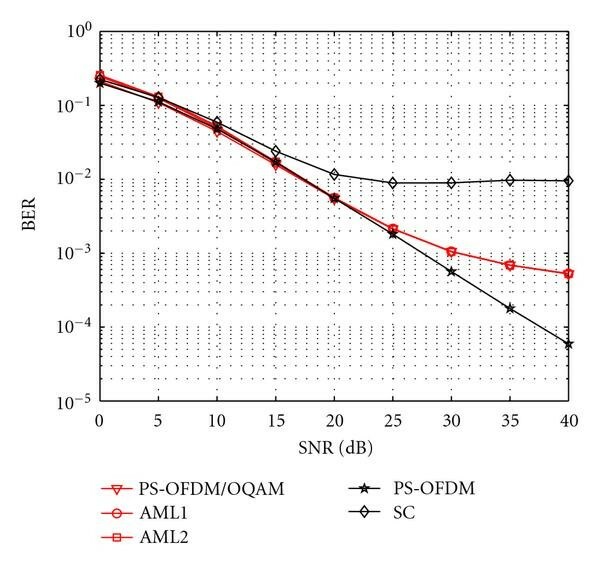 OFDM/OQAM systems are more sensitive to synchronization errors than single-carrier systems. In particular, carrier frequency-offset (CFO) and symbol timing (ST) estimation errors can lead to a performance degradation. For this reason, it is very important to derive efficient synchronization schemes. In the last years several studies have been focused on blind or data-aided synchronization for OFDM/OQAM systems. For example, in [7, 8] blind CFO estimators have been derived. Moreover, in  a blind joint CFO and ST estimator is proposed. Furthermore, in  a synchronization scheme for data-aided ST and CFO estimation with robust acquisition properties in dispersive channels is developed. Finally, in [11, 12] a full synchronization method utilizing frequency domain scattered pilots in the time domain is proposed. However, all cited estimators are designed for down-link communications. In this paper we consider the problem of data-aided synchronization for OFDM/OQAM systems in multipath channels. In particular, the joint maximum-likelihood (ML) estimator for CFO, amplitudes, phases, and delays, exploiting a short known preamble, is derived. The ML estimators for phases and amplitudes are in closed form. Moreover, under the assumption that the CFO is sufficiently small, a closed form approximate ML (AML) CFO estimator is obtained. By exploiting the obtained closed form solutions a cost function whose peaks provide an estimate of the delays is derived. In particular, the ST (i.e., the delay of the first multipath component) is obtained by considering the smallest estimated delay. The proposed joint estimator is derived with reference to a down-link scenario; however, by following an approach similar to that considered in , it can be easily modified to be exploited for up-link communications. The performance of the proposed joint AML estimator is assessed via computer simulations and compared with that achieved by the joint AML estimator designed for AWGN channel and that achieved by a previously derived joint estimator for OFDM systems. The paper is organized as follows. In Section 2 the OFDM/OQAM system model is described. In Section 3 the proposed data-aided estimator is described. In Section 4 numerical results obtained in AWGN and multipath channel are presented and discussed. Finally, conclusions are drawn in Section 5.
, superscript denotes the complex conjugation, real part, imaginary part, and absolute value. Moreover, denotes transpose and the argument of a complex number in . Finally, lower case boldface symbols denote column vectors. where is the OFDM/OQAM symbol interval and denotes the number of information-bearing symbols in the burst. Moreover, in (2) is the set of size of used subcarriers, and denote the real and imaginary part of the complex data symbol transmitted on the th subcarrier during the th OFDM/OQAM symbol, while the real-valued and unit-energy pulse-shaping filter is bandlimited within . presents the highest peaks. Moreover, the lowest among the obtained delays represents an estimate of the ST. If the number of paths is not known in advance, a sufficiently high number of paths should be considered to avoid to lose a strong path and, moreover, to avoid to consider very weak paths. The obtained delays can be substituted in (24) to obtain the CFO estimate, and, finally, phases and amplitudes can be obtained from (13) and (14), respectively. Note that the numerical results reported in the next section show that the considered approximation of (25) leads to a symbol timing estimator with satisfactory performance if the number of subcarriers is sufficiently large. where and . Note that for the MSE in (29) is coincident with the MSE of the CFO estimator for OFDM systems proposed by Schmidl and Cox (SC) in . It is worthwhile to emphasize that the MSE in (29) has been derived by neglecting the interference at the output of each matched filter due to adjacent subcarriers. Therefore, the actual performance of the proposed AML CFO estimator presents a floor that is not predicted by (29). However, it is shown in the next section that the approximate expression in (29) can be exploited in the range of moderate values. the channel is fixed in each run but it is independent from one run to another. in the fourth case, termed OC4, condition (28) is satisfied and the data burst is not delayed. Figures 1 and 2 display the root mean square error (RMSE) of the considered CFO estimators as a function of in the previously described operating conditions and in the case where the number of subcarriers is and the actual value of the normalized CFO is . Specifically, the AML CFO estimator for multipath channel reported in (24) is denoted as AML1 while the label AML2 indicates the AML estimator for AWGN channel, that is, that based on the choice . In the case of the AML1 CFO estimator two paths have been considered to avoid to lose a strong path and, moreover, to avoid to consider very weak paths. 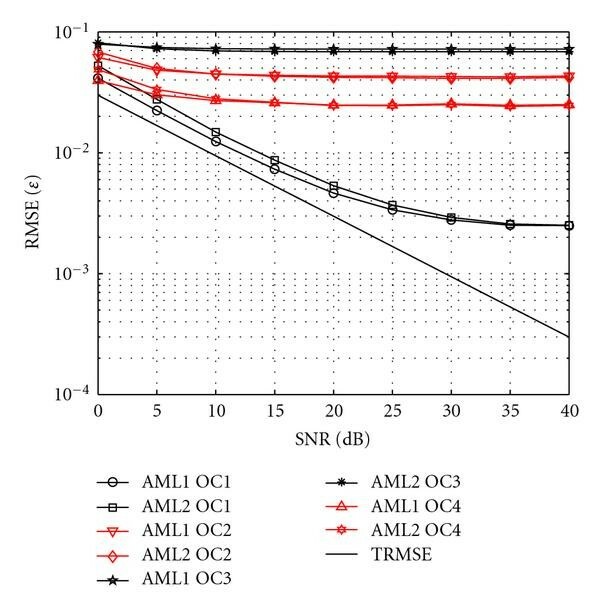 As one would expect, the performance of both AML1 and AML2 estimators is coincident in AWGN channel (see Figure 1) while the AML1 outperforms the AML2 estimator in multipath channel (see Figure 2). Moreover, only when condition (28) is satisfied (curves labeled as OC1 and OC4), the insertion of the considered delay in the data burst can lead to a significant performance improvement both in AWGN and multipath channel. In particular, when condition (28) is satisfied and the data burst is delayed (curves labeled as OC1), a floor is observed only around dB. In Figures 1 and 2 is also reported the theoretical RMSE (TRMSE) predicted by (29). The results show that the derived expression can be exploited in AWGN channel for dB. 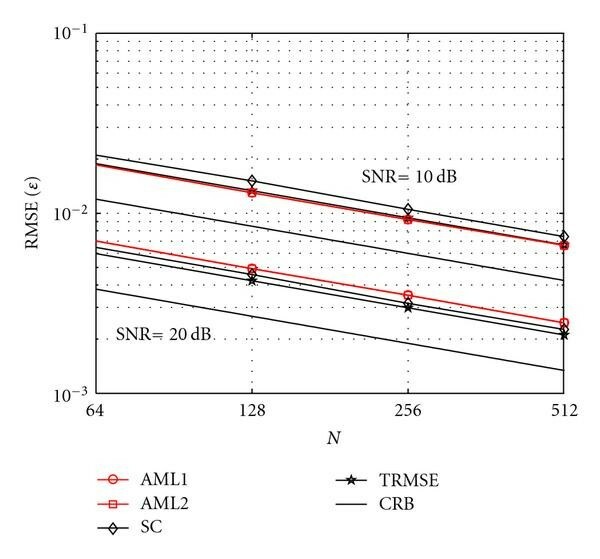 As regards the performance of the AML1 and AML2 ST estimators no errors were observed in AWGN channel while in multipath channel A an RMSE (normalized to the OFDM/OQAM interval ) less than was observed in all operating conditions for dB. Taking into account the previous results in the following experiments only the operating condition OC1 is considered since it assures the best performance. 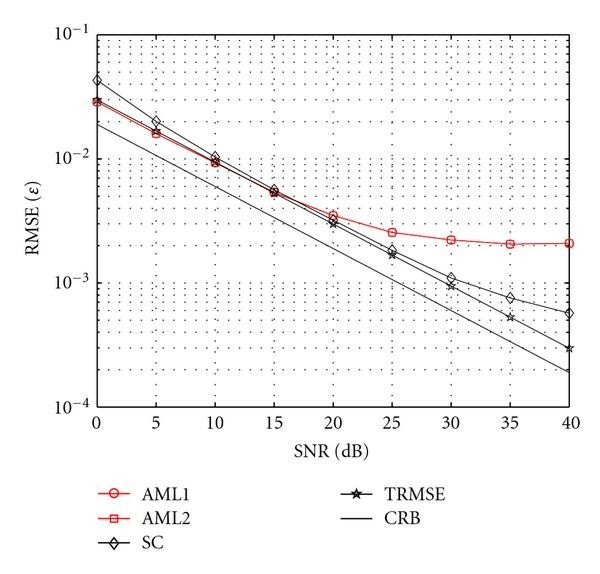 In particular, in Figures 3 and 4 the normalized RMSE of the AML CFO estimators is compared with that of the SC estimator proposed in , both in AWGN (Figure 3) and in multipath channel A (Figure 4). Specifically, the number of subcarriers is and the actual value of the normalized CFO is . Note that the performance comparison with the SC estimator is made by exploiting the proposed algorithm in an OFDM/OQAM system and the SC algorithm in an OFDM system, and, moreover, in the case of the SC algorithm an OFDM symbol with two equal parts is exploited. The results show that in multipath channel A the performance of both estimators presents a floor, but for different reasons. 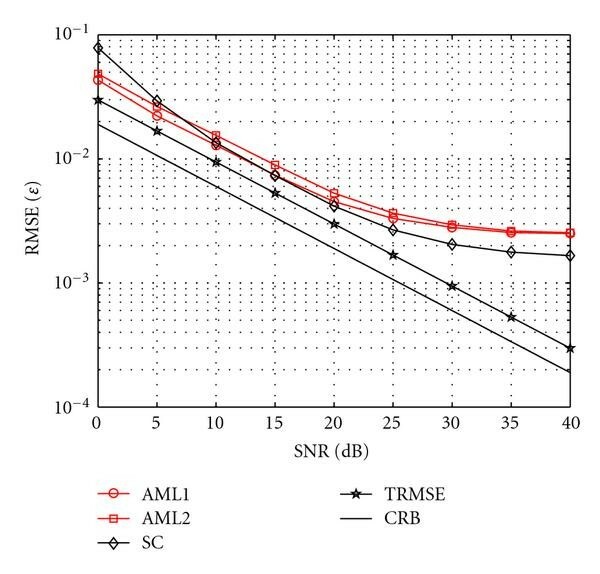 In the case of the SC estimator the floor is due to the inaccuracy in the ST estimate (normalized RMSE nearly equal to (see Figure 5)), while in the case of the AML estimator the floor is due (as well as in the AWGN channel (see Figure 3)) to the interference from adjacent subcarriers. Moreover, in Figures 3 and 4 is reported also the Cramèr -Rao bound (CRB) on CFO estimation for OFDM/OQAM systems. 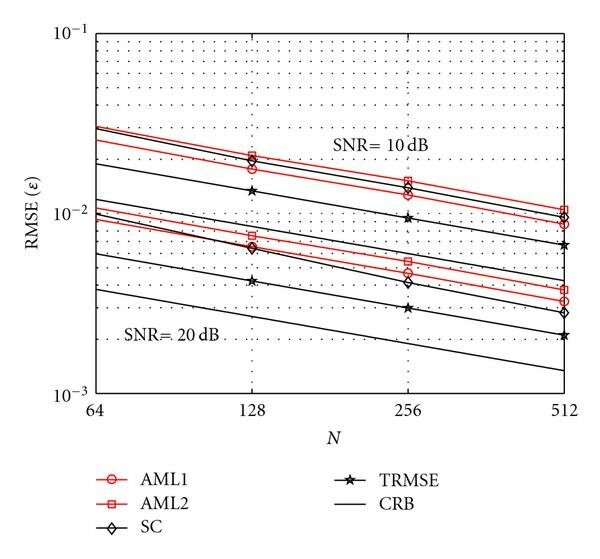 The performance loss with respect to the CRB is quite contained for SNR values lower than dB. Specifically, as it is shown in the following the accuracy is sufficient to assure a negligible degradation with respect to the case of perfect synchronization. Performance of the proposed AML CFO estimators in AWGN channel. Performance of the proposed AML CFO estimators in ITU Vehicular A multipath channel. Performance of the considered CFO estimators in AWGN channel. Performance of the considered CFO estimators in ITU Vehicular A multipath channel. Performance of the considered ST estimators in ITU Vehicular A multipath channel. To gain some insight about the acquisition range of the considered estimators in Figure 6 is reported the normalized RMSE of the AML CFO estimators as a function of the actual value of the normalized CFO in AWGN (solid lines) and multipath channel A (dashed lines) for dB. In Figure 6 is also reported the RMSE of the SC estimator. Note that in this case a number of Monte Carlo trials have been performed. The results show that although the AML estimators have been derived under the assumption of small values of CFO, they assure a satisfactory performance in the range . Of course if the value of the normalized CFO can belong to a larger interval, an additional stage at the beginning of the preamble needs to be inserted to obtain a coarse estimate of the CFO within a sufficiently wide range. Performance of the considered CFO estimators as a function of the actual value of the normalized CFO. Figures 7 and 8 show the normalized RMSE of the considered CFO estimators as a function of the number of subcarriers in AWGN (Figure 7) and in multipath channel A (Figure 8), and for two conditions. The results show that in AWGN the performance of both AML1 and AML2 estimators is coincident with that predicted by (29) for dB while is slightly different for dB. 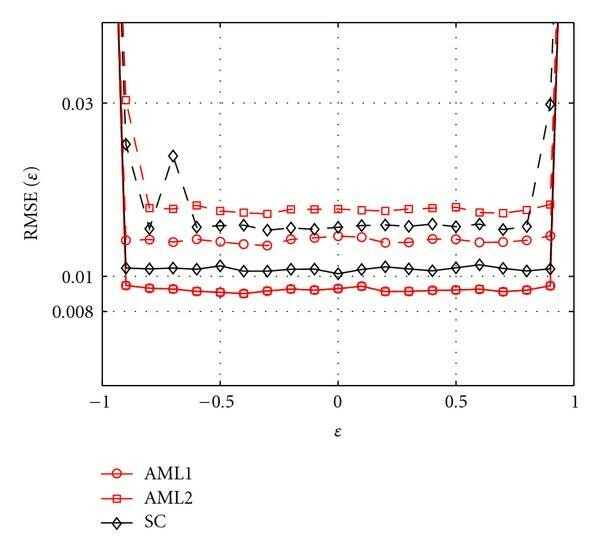 Moreover, Figure 8 shows that in multipath channel A the AML1 CFO estimator outperforms the AML2 estimator and assures estimates whose accuracy is quite similar to that provided by the SC estimator. As regards the performance of the AML and SC ST estimators results, not reported here for the sake of brevity, have shown that the SC ST estimator assures a normalized RMSE nearly equal to both in AWGN and multipath channel due to the presence of the plateau. On the other hand, as regards the AML ST estimators no errors were observed in AWGN while a normalized RMSE less than was obtained for . Performance of the considered CFO estimators as a function of the number of subcarriers in AWGN channel. Performance of the considered CFO estimators as a function of the number of subcarriers in ITU Vehicular A multipath channel. Finally, Figures 9 and 10 show, for and , the bit error rate (BER) obtained with the adoption of the AML and SC estimators followed by a one-tap equalizer with perfect knowledge of the channel and of the residual synchronization errors. The performance is compared with that of the perfectly synchronized OFDM/OQAM system (PS-OFDM/OQAM) and with that of the perfectly synchronized OFDM system (PS-OFDM) with CP . Note that the slight difference between the performance of the PS-OFDM/OQAM and that of the PS-OFDM is due to the fact that, to take into account the energy loss due to the CP, the amplitude of the OFDM signal has been reduced by where CP . The results show that both in AWGN and multipath channel A the AML estimators assure a negligible degradation with respect to the perfectly synchronized system while the adoption of the SC synchronization scheme leads to an error floor due essentially to the inaccuracy of the ST estimates. BER of the considered joint estimators in AWGN channel. BER of the considered joint estimators in ITU Vehicular A multipath channel. In this paper we have dealt with the problem of data-aided synchronization for OFDM/OQAM systems in multipath channels. In particular, the joint ML estimator for CFO, amplitudes, phases, and delays, exploiting a short known preamble, has been derived. Exploiting the closed form ML estimators for phases and amplitudes and the closed form AML CFO estimator for small CFO values, a cost function that can provide an estimate of the ST, has been obtained. 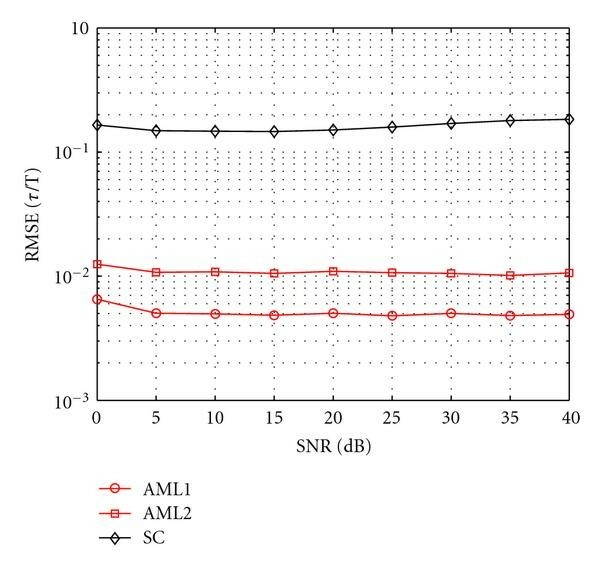 The performance of the joint AML1 estimator for multipath channel has been assessed via computer simulations and compared with that achieved by the joint AML2 estimator designed for AWGN channel. 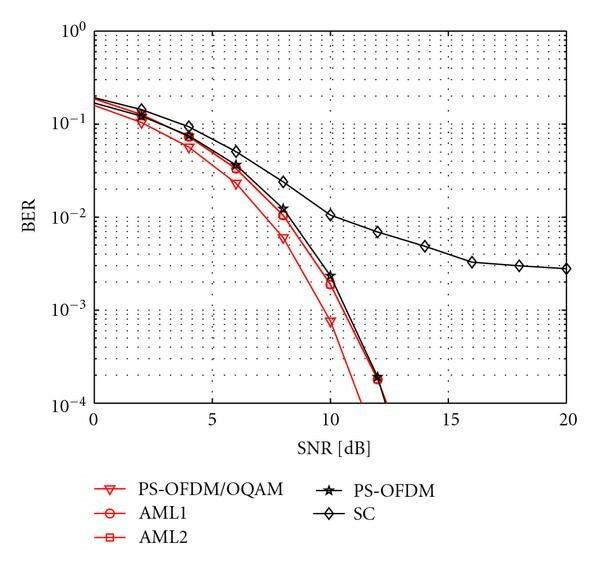 Moreover, a comparison with the performance achieved by the SC estimator for OFDM systems has been made. 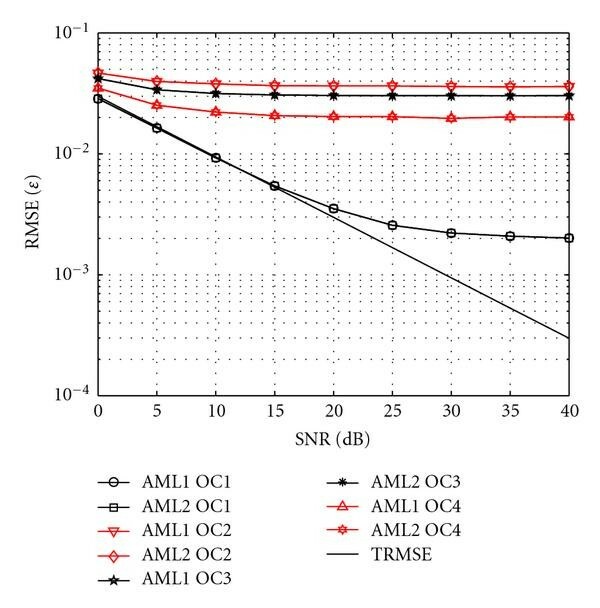 The results have shown that if it satisfied a condition involving the training symbol and the data burst is delayed by one OFDM/OQAM symbol interval with respect to the training burst, the AML CFO estimators assure a performance similar to that achieved by the SC estimator in multipath channel A, while the AML ST estimators outperform the SC estimator. Moreover, an approximate expression for the MSE of the AML CFO estimators has been derived that can be exploited to predict the actual performance in the range of moderate SNR values. Finally, a comparison between the BER obtained with the adoption of the AML and SC estimators followed by a one-tap equalizer with perfect knowledge of the channel and of the residual synchronization errors has been made. The results have shown that both in AWGN and multipath channel A the AML estimators assure a negligible degradation with respect to the perfectly synchronized system while the adoption of the SC synchronization scheme leads to an error floor due essentially to the inaccuracy of the ST estimates. This work was supported in part by the European Commission under Project PHYDYAS (FP7-ICT-2007-1-211887). In this case, if the interference terms and in the RHS of (A.8) and (A.9), respectively, were negligible, the CFO estimate would be (see (24) for ) . The presence of the interference terms in the RHS of (A.8) and (A.9) leads to an error floor. Moreover, if condition (A.7) is not fulfilled an error floor can be observed also when the interference terms are negligible (see (A.5) and (A.6)). However, in the section on numerical results it is shown that the error floor can be substantially reduced when condition (A.7) is satisfied.